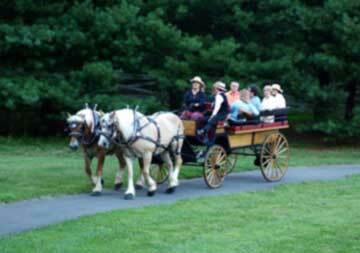 Travel back to simpler times with your significant other, or even your entire family, with the Smoky Mountain Picnic & Romantic Carriage Rides. The horses are beautiful and carriages tastefully and immaculately turned out. Snuggle into your cozy carriage and enjoy this scenic 4200-acre estate with it's picturesque whiteboard fencing, stunning landscapes, and mountain stream filled with rainbow trout. During the spring and summer, you will see beautiful wildflowers and bubbling brooks. During the winter, you will marvel at snow covered hills, breathtaking landscapes and sleigh bells! All the while be on the lookout for local wildlife, which is abundant in the area. You can customize your tour to fit your special occasion by choosing from any of the offered carriage rides listed. Whether you're looking for romance or a day out with your family, you're certain to enjoy one of these elegant tours. Don't forget to bring your camera, so you can have pictures of your memorable carriage ride experience! A special offering for couples, the Picnic Carriage Ride for Two includes a country picnic meal prepared by world class chefs at a neighboring resort that is known for its fine dining. Your driver will stop in a private meadow where you and your loved one will enjoy an unforgettable romantic outdoor dining experience. Take your special someone on a Romance Carriage Ride for Two in an authentic horse-drawn carriage through the scenic foothills of the Smoky Mountains. Echobrooke Farm's Romance Carriage Ride for Two is an ideal activity for anniversaries, Valentine's Day, honeymoons, or any other getaway you may be planning with your spouse or significant other. 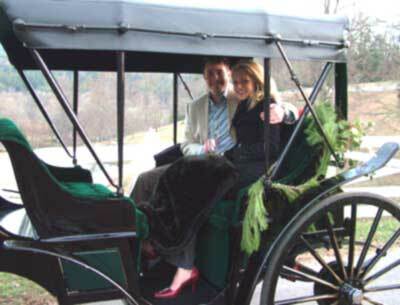 Romance Carriage Rides for Two also make an excellent setting for marriage proposals, so gentleman, if you're planning to pop the question, this picturesque Smoky Mountain carriage ride makes for a proposal she'll never forget. Return to the days of yesteryear with a Hay Wagon Ride through the rural Smoky Mountain setting of EchoBrooke Farm. The calming rhythm of the horses hooves pulling the wagon will set the tone as you gaze out across the valleys and foothills of the Great Smoky Mountains. All rides are approximately 2 hours. Dressy casual or casual clothing is recommended. It is requested that guests not wear cut-off jeans or t-shirts.